Looking for some fun activities this Halloween? There’s lots to do on the Heights! 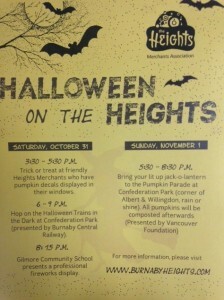 Take the kiddies to participating Burnaby Heights merchants for trick-or-treating, hop on the Halloween train at Confederation Park, watch the fireworks and join in the Pumpkin parade!